A contractor who was working in the Doral area struck a 24-inch Miami-Dade Water and Sewer Department (WASD) water pipe that resulted in a loss of water service for a portion of the City of Doral. WASD crews are on site making repairs to the pipe. MIAMI (July 2, 2018) — A contractor who was working in the Doral area struck a 24-inch Miami-Dade Water and Sewer Department (WASD) water pipe that resulted in a loss of water service for a portion of the City of Doral. WASD crews are on site making repairs to the pipe. The affected area is as follows: the northside of Northwest 34th Street to the southside of Northwest 41st Street between the westside of Northwest 107th Avenue to the eastside of Northwest 136th Place. 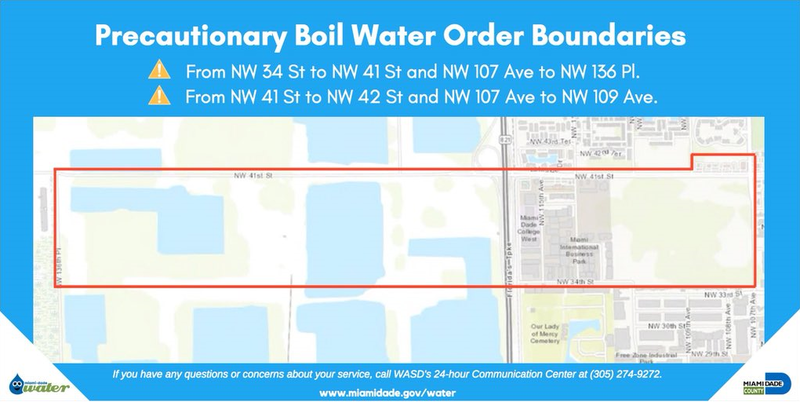 Also, the northside of Northwest 41st Street to the southside of Northwest 42nd Street between the west side of Northwest 107th Avenue to east side of Northwest 109th Avenue. Once repairs are completed and water service is restored, all water used for drinking, cooking, brushing teeth, making ice, and washing dishes should be boiled until further notice prior to consumption. Water should be brought to a full rolling boil for at least one minute. As an alternative bottled water may be used. There is no problem with using the water for bathing and other household needs. If you do not live within the affected areas, you do not need to follow the Precautionary Boil Water Order. WASD will be sampling the water. Once all tests are cleared, the boil water restrictions will be lifted and those affected will be notified. It is the priority of the Miami-Dade Water and Sewer Department to provide safe, reliable service to its customers. If you have any questions or concerns about your service, call our 24-hour Communications Center at 305-274-9272. For additional information about Department services and programs, visit the department’s website.